Hey everybody thought I would post up my own project car. Some of the site OG's probably know its origins or have supplied parts in one form or another. It has travelled a long way, coast to coast and into another country. It started life with 034 motorsport in California and now resides in Nova Scotia, Canada. 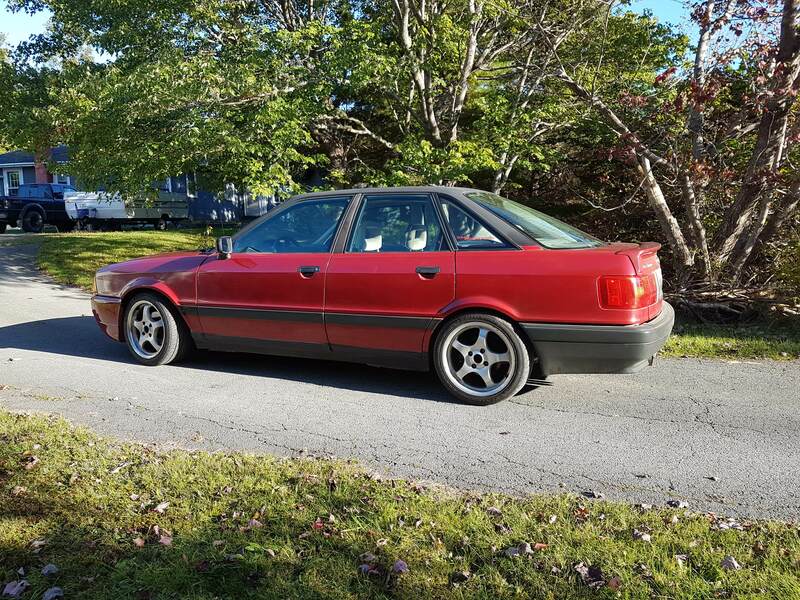 It is a 1988 audi 80 with a 4.2abz swap. This thing is intense it handles like a go cart and the v8 is awesome in this chassis. I had to do a bit of digging to find some of the things that were done to it in the past. Dont mind the layout the list is for my reference as the car evolves and things change. 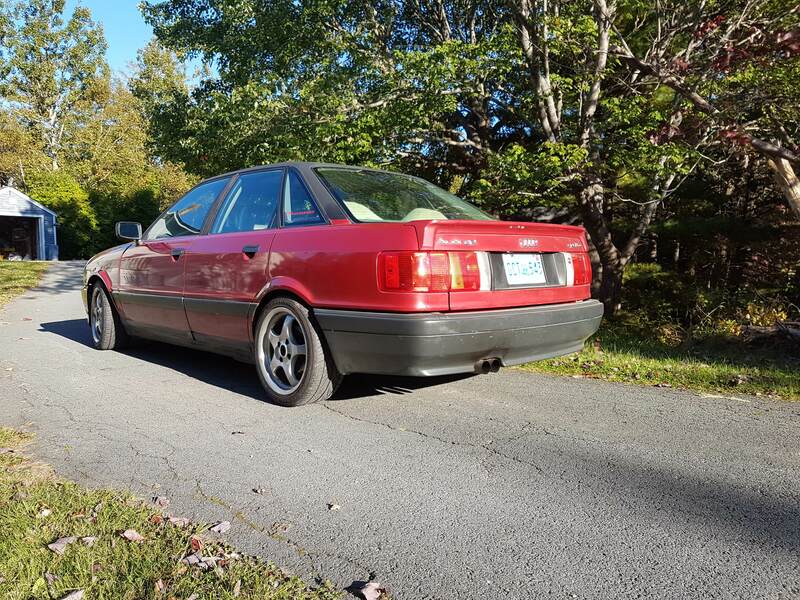 Body: 1988 audi 80 b3, front clip is a fiberglass replica. The headlights, fenders, and hood are from a b4 90. Engine: 4.2 abz aluminum v8 from a 99 audi A8. The heads are ported, valves are back cut and polished, arp headstuds hold it together. 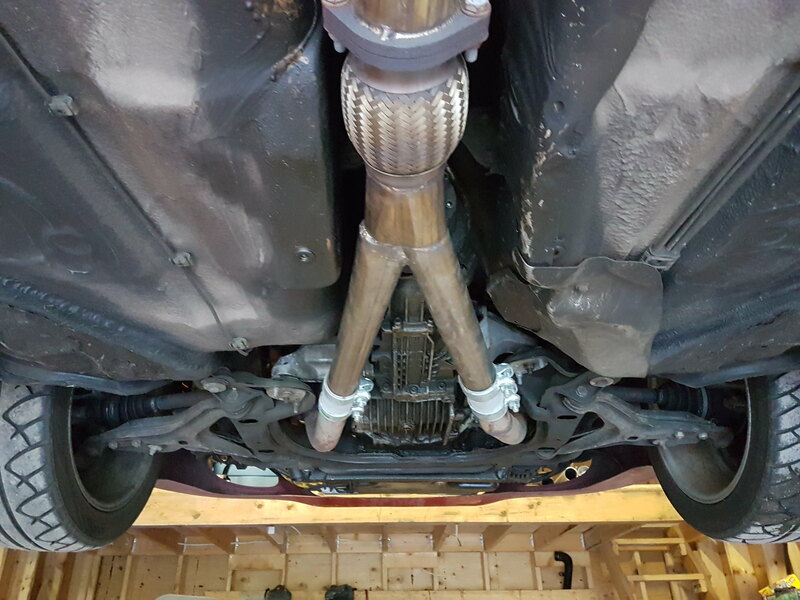 The engine is ridgedly mounted to a custom made tube front subframe. 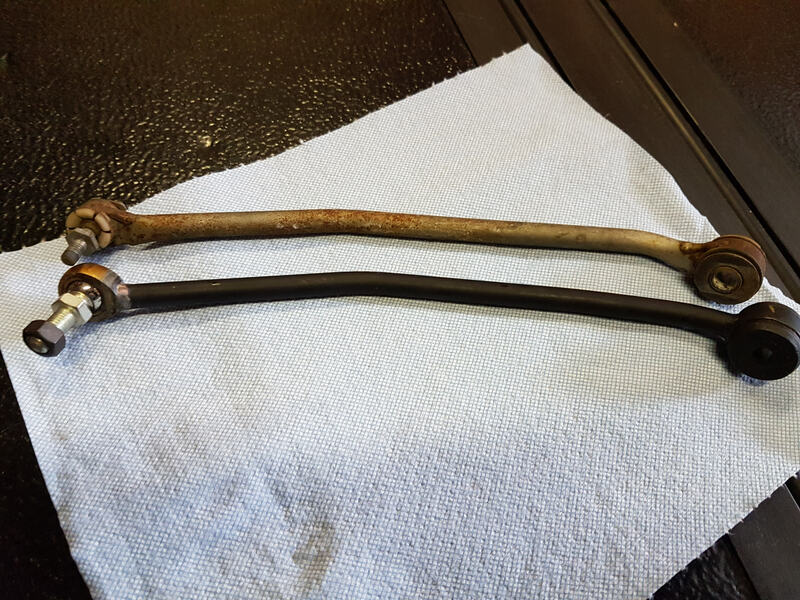 The injectors were cleaned and balanced. A 3" core aluminum radiator is up front. The battery was relocated to the trunk and the battery tray removed. 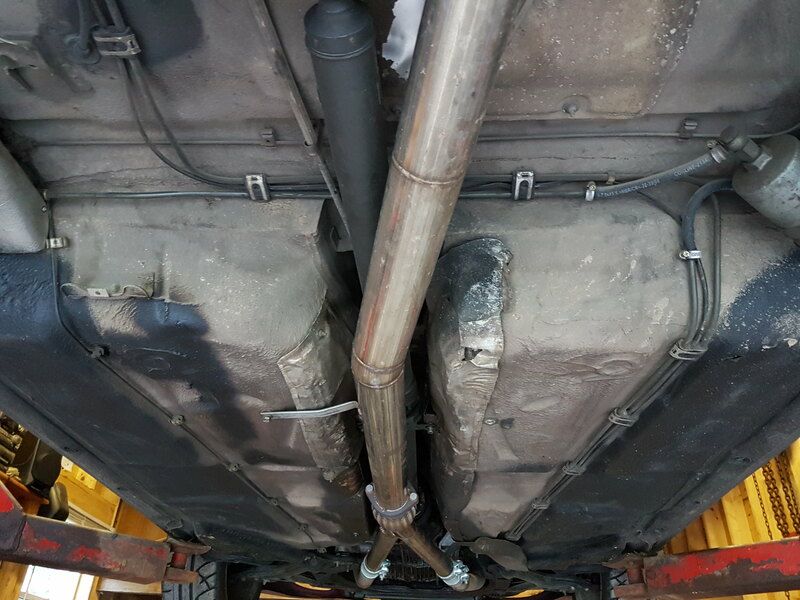 Headers were installed and attached to an exhaust made from 3" stainless front to rear with a single muffler 3" inlet and two 2.5" outlets. 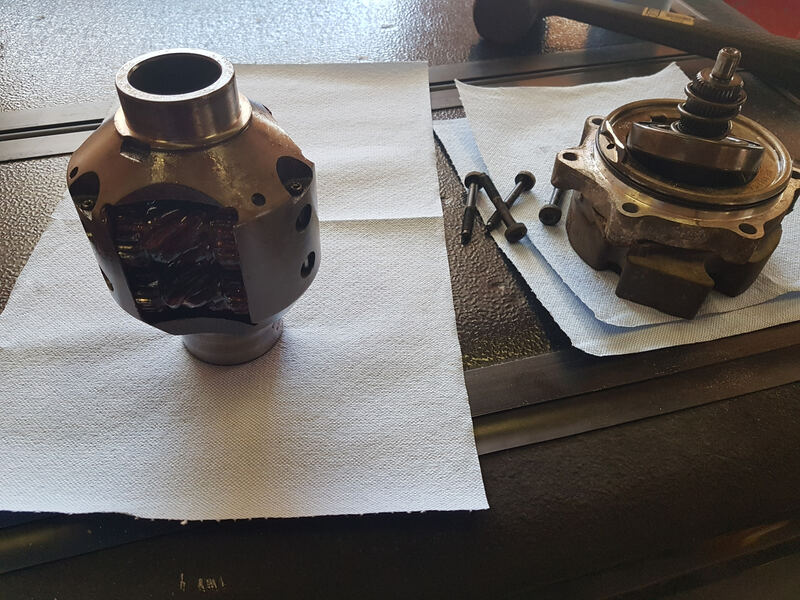 Driveline: 01a 5spd with a modified center diff for a 80/20 torque split. Rear end has a mechanical lsd. The gear ratio between the two is 4.11 The mounts are all aluminum 034 inserts. Management: The engine is managed by an 034 iic ecu and 034 relay panel through a modified abz harness. Suspension: KW V3 coilovers spring rates of 450/400 dual adjust and custom valves front and rear. modified with the tierod mounting points cut off, rotated and rewelded on lower for better on track feel. Strut mounts are aluminum inserts with high durometer poly bushings. Interior: Cluster swapped to one in kms (original us car) stock interior, underlay and sound deadining were removed. There is a bunch I'm forgetting / still don't know. I'll add to the list as it comes to me! Before I stored it I went to meet up with a local vw enthusiast to sell some vr6 parts. When I left I was driving it pretty hard and broke the transmission. I haven't put it on the hoist yet but it is leaking trans fluid everywhere. I figured what a great time to upgrade! 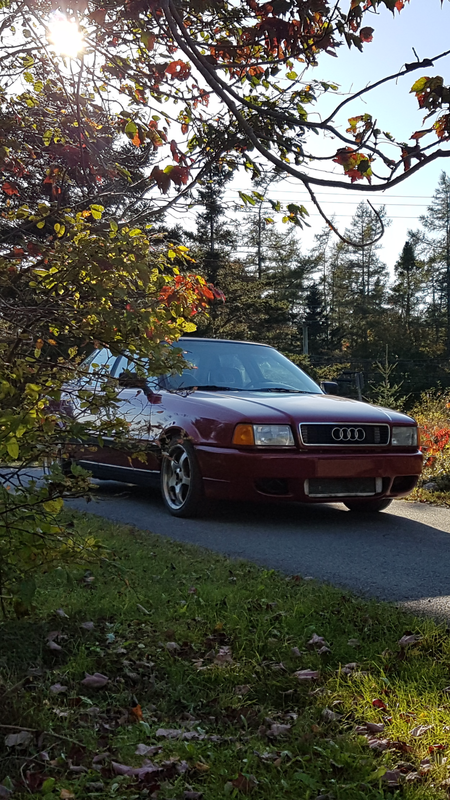 I picked up a 6 spd O1E fyf from a 2002 a4 v6, driveshaft from an audi 4000, rear diff cups from a b5 a4, ordered rs2 mounts from Iroz motorsports, solid shift linkage and crossbar from JHM, stiffer on center spring, and sent my center diff in for the 4:1 modification. As soon as it warms up I'll be removing the old trans 01a and installing the new 01e. The only modification that will take some time is drilling and installing the new vr sensor in the right spot. More pictures to come of the above mentioned parts! Wow, you got an old 034 car? It was Nate's I think. Or is that the 5 cylinder? There might still be a project thread somewhere on MG.
ChrisAudi80 wrote: Wow, you got an old 034 car? That's awesome! Aside from the 01E upgrade list, what are your plans? Good to see it here! I remember when Sam was helping get it ready for your drive. Looks awesome, and ABZ's are great in the small chassis! Nateflix56 wrote: That's awesome! Aside from the 01E upgrade list, what are your plans? I have a S2 bumper complete with fogs to go on it. 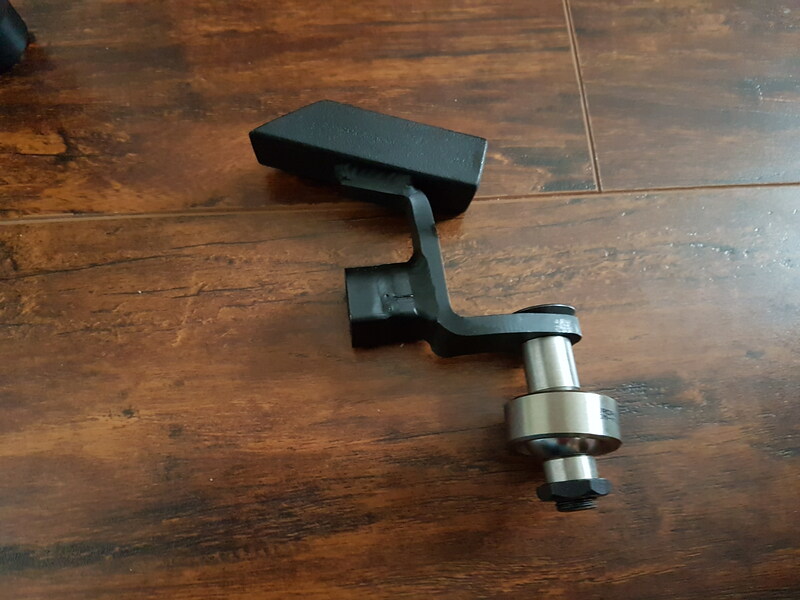 I either need to get my hands on a mounting bracket or make ones to fit. Then paint to have everything match. 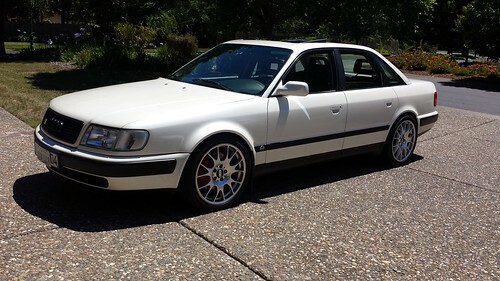 I'm going to finish putting in the black leather interior, I have the door cards with the woodgrain tops and a nardi/audi factory steering wheel to go in. I'm working on the rear seat back now. I think I'm going to take it from my urs4 when I part it out. Last but not least get it out for autocross and the track to have some fun! Awesome, glad to see this thing living on! Surviving and thriving! Awesome intro, can't wait to see this legend evolve. Out of curiosity, are you a Caper or a (main) Islander? PRY4SNO wrote: Out of curiosity, are you a Caper or a (main) Islander? Also, my woman was born in Truro so I was just naturally curious. Different car, but very similar builds. Nate's was a red '89 90q and last I knew it was in WA or OR somewhere. alxdgr8 wrote: Different car, but very similar builds. Nate's was a red '89 90q and last I knew it was in WA or OR somewhere. Does your flywheel have the 60/2 indentations in it? 90quattrocoupe wrote: Does your flywheel have the 60/2 indentations in it? Yes it does, the vr sensor is on the bellhousing (01a) A hole was drilled for it to line up. 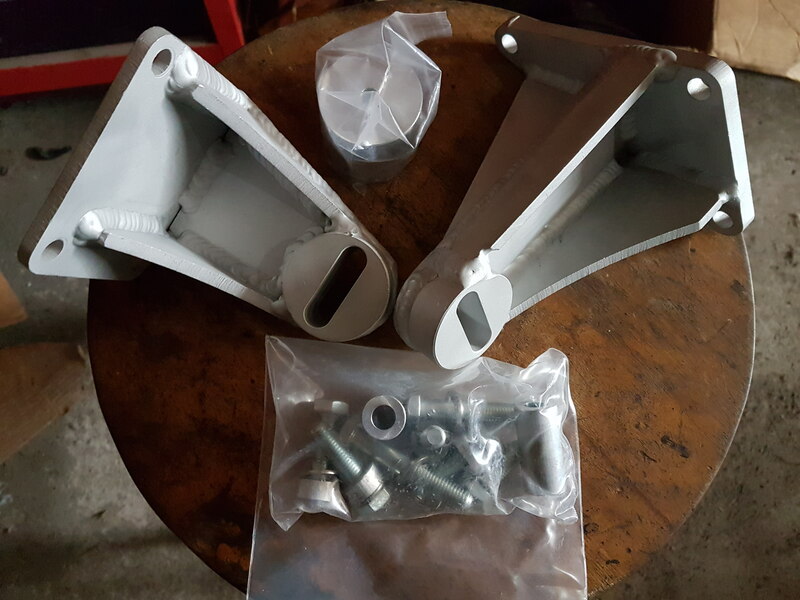 Not much to update yet but here are some photos of the parts ready and waiting to go in. 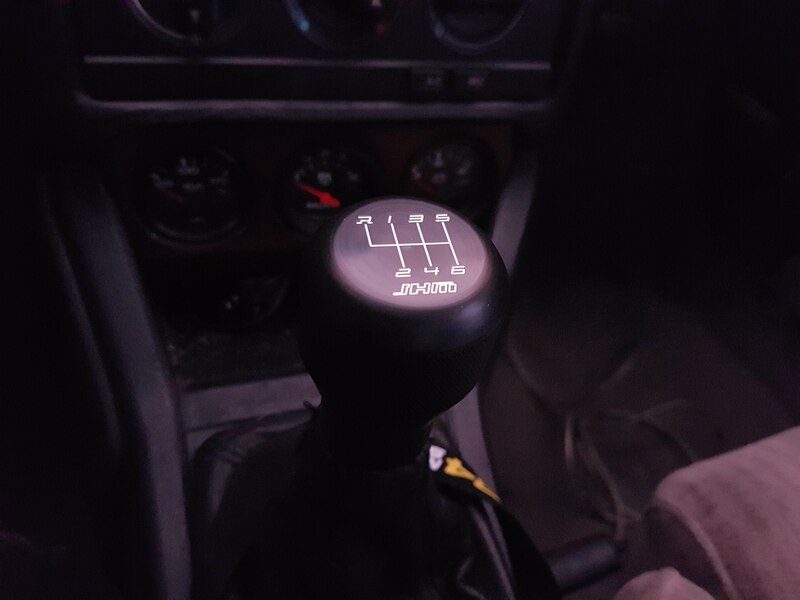 4:1 modded center diff, jhm weighted shifter, upgraded linkages to get rid of the slop, stiffer spring for centering, a jhm 6 spd shift knob and Iroz rs2 replica mounts to put it all in place. I noticed the two mounting holes side by side on the trans but wasn't sure if one would line up. I'll definetly give it a try it'll make things easier. I'll just have to reprogram the ecu for the 0° tdc. 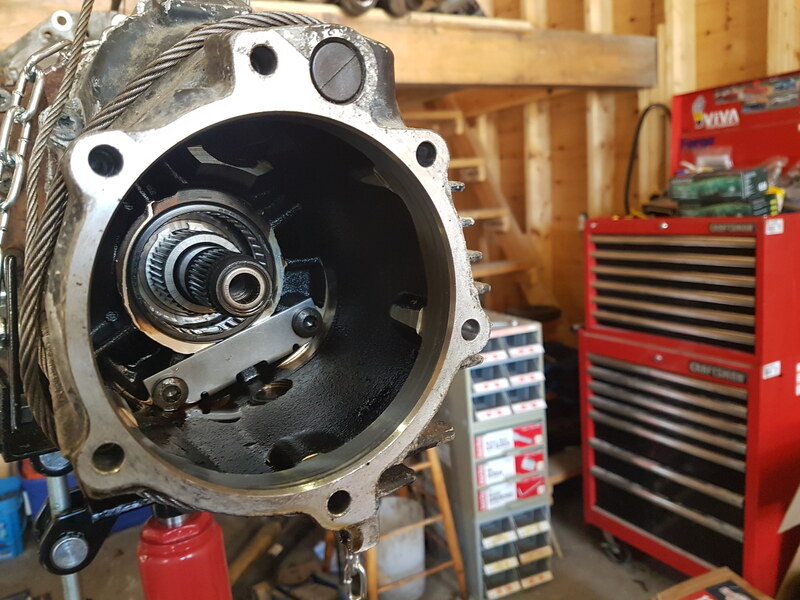 What are you running for management Greg and is your fyf behind a v8, how do you find the gearing? I used to have a S2 01e in the car. I picked up a FYF and shipped it to Mark Swanson. Had him do the updated 1st/2nd gear collar and install a .56 TDI 6th gear. Now it just lopes along in 6th at 2400rpm at 75mph. I love it. It was at 3000rpm or just over that at 75mph with the S2 gearbox. 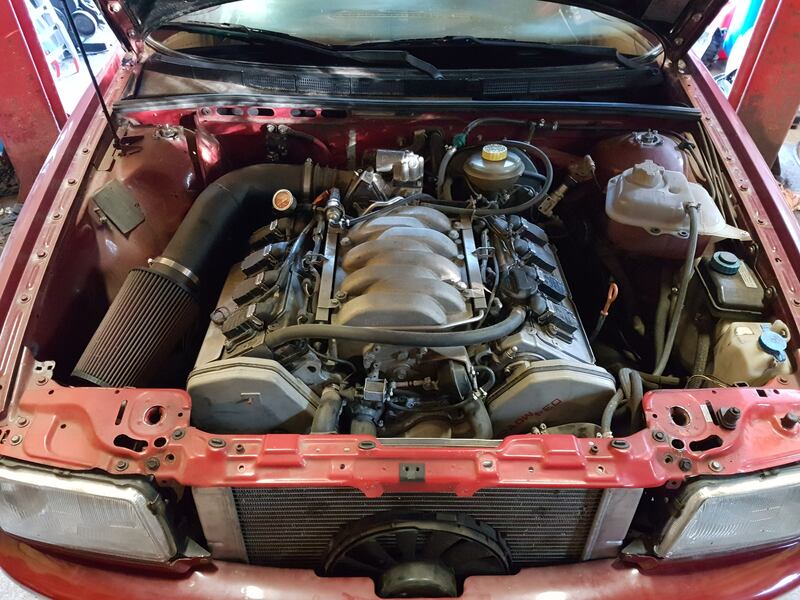 I originally had an 034IIc in the car. Now it is VEMS. Also done by Mark Swanson. Thanks Greg! That info will come in handy, I was looking at a lower 6th gear but wasn't making any headway. I'll give Marc a call and see if I can get something similar to the .56. On my 01a it was around .76(I think) now it will be .73 with the fyf. 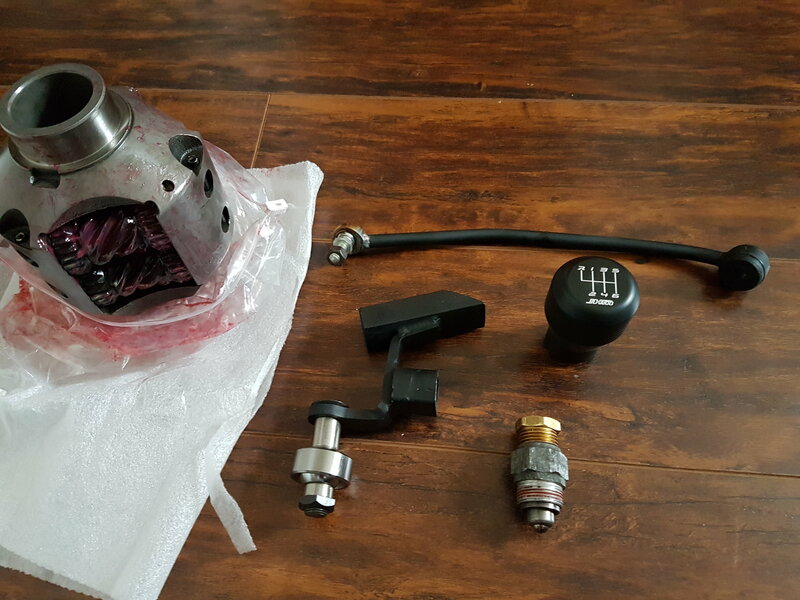 I started to put parts together in preparation of the transmission swap for the v80. I built the transmission jack that was sitting in the garage and installed the 4:1 center diff. 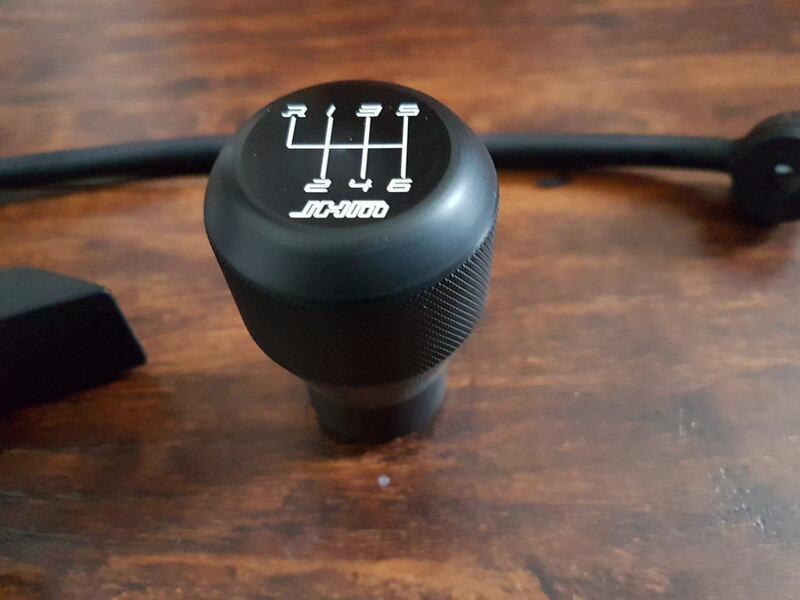 Tomorrow I am installing the stiffer on center shift detent and modifying the shift linkages. 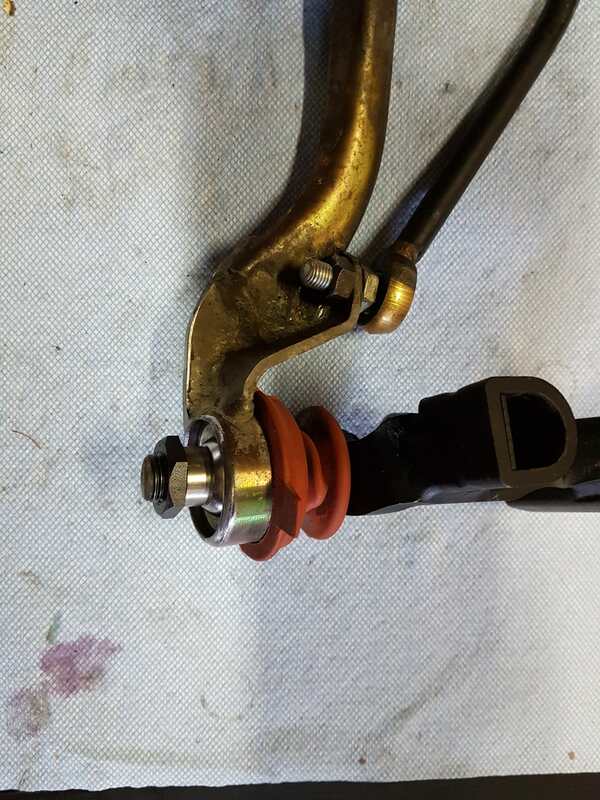 I rebuilt the linkage for the 01e last week, first up was the cross bar/support. 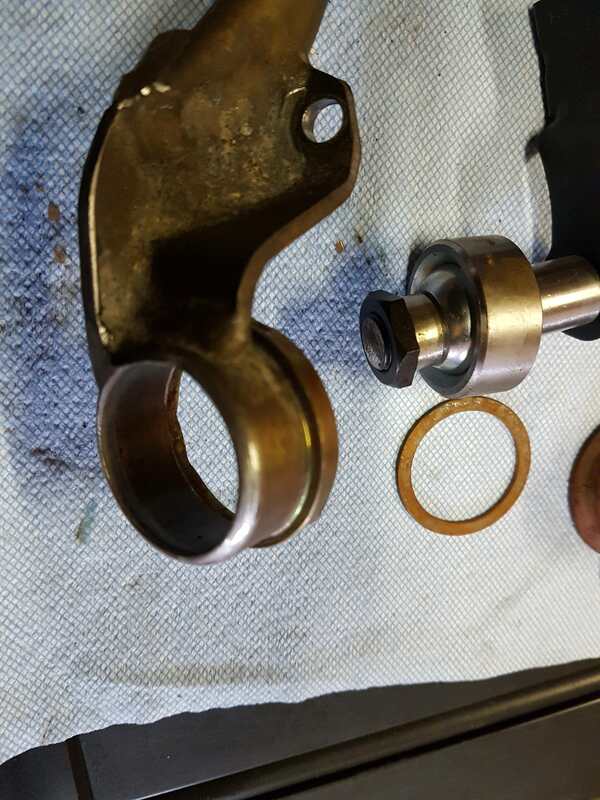 It has new solid bushings and a hiem joint on the transmission side. 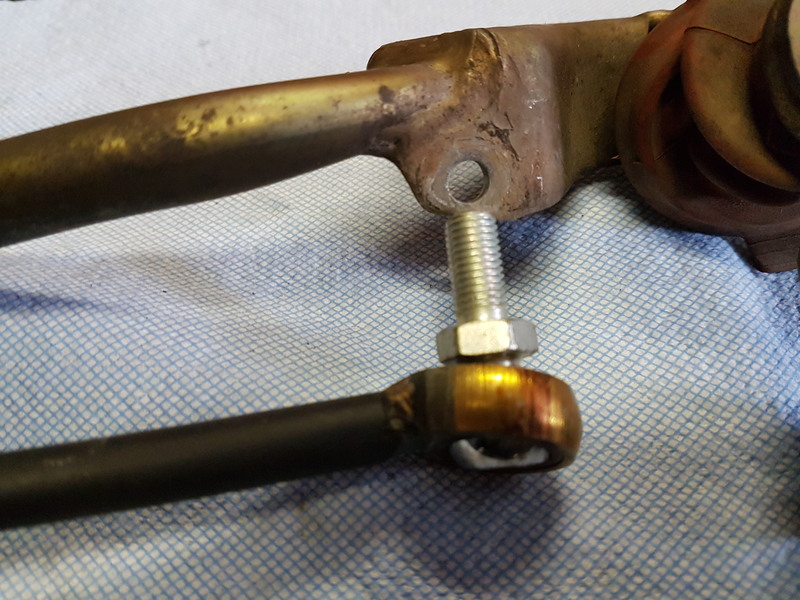 The bolt used in the hiem jont was too large for the hole in the linkage so it had to be drilled out to fit. Next up was modifying the linkage for the spherical bearing. 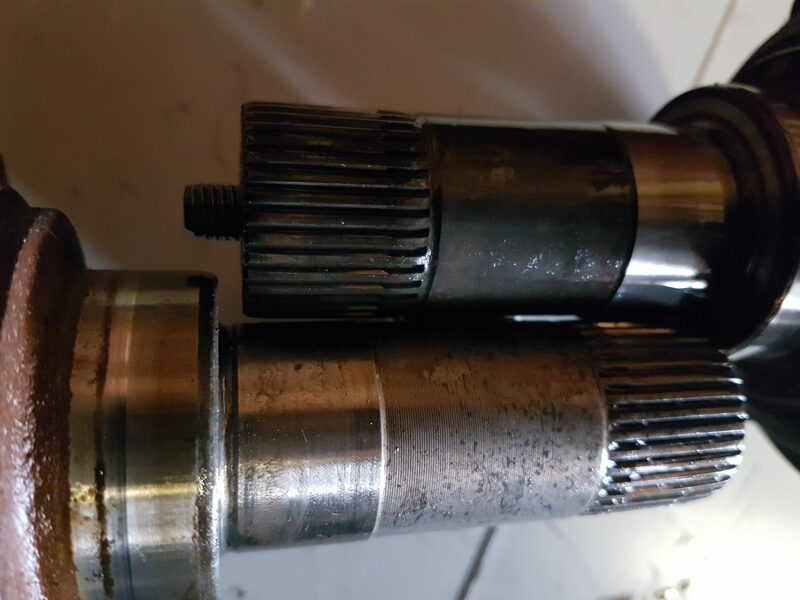 Used a grinder to clearance the angled portion and a file to clean up all the burrs and smooth things out. 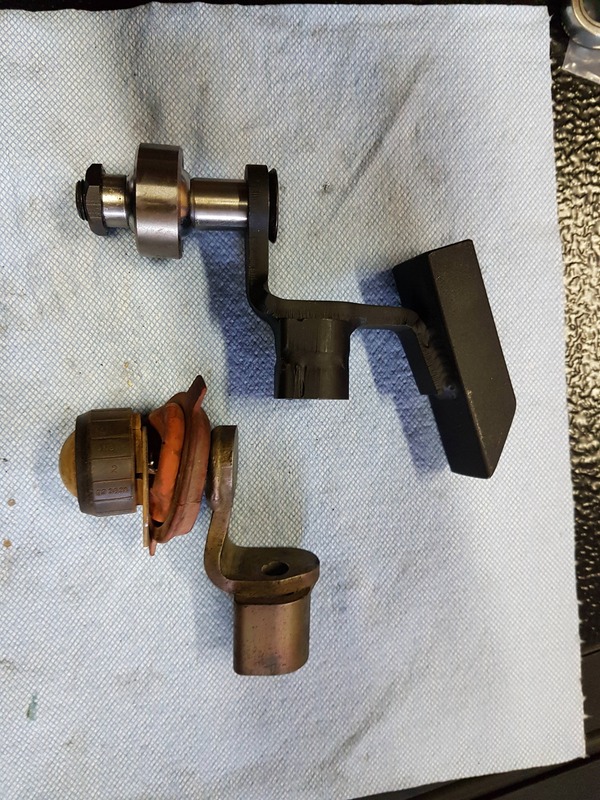 Pics of the old ball and cup beside the new metal bearing and the finished product. Im going to wait on cutting and flipping the cup end of the linkage until the trans is installed in case there is a fitment issue. So next up is getting the axles back from the machine shop. They are out getting 3mm removed from the ends. 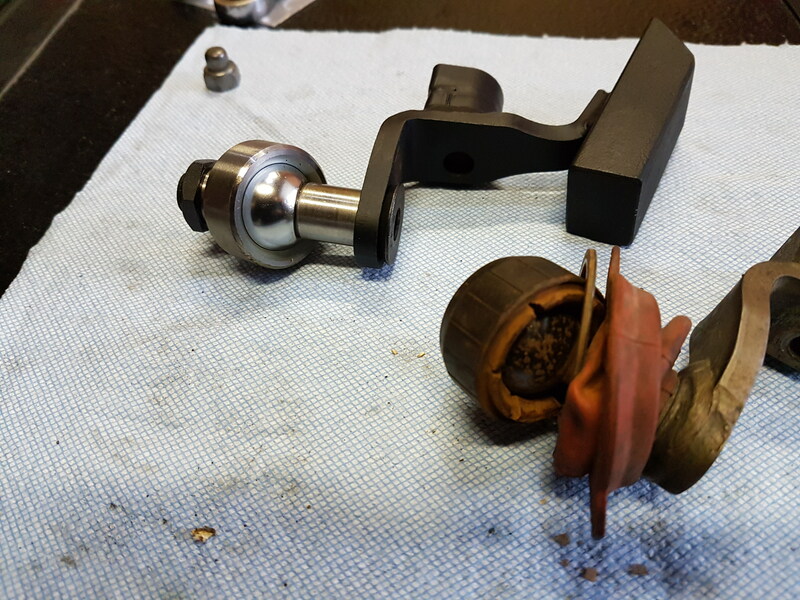 Here's a photo showing the 01e 108mm cups (bottom) and a4 rear end 100mm cups (top). Things have slowed down a little at the moment. I was trying to verify timing at 0° and am having one he'll of a time getting the ecu to communicate. None of my usb/serial convertors would connect properly. I could see the settings for all of the components however I can't change those settings. The Ecu loses comms as soon as I attempt to update the settings. I resorted to digging out our old dell desktop computer from 10 years ago because it has a serial port. I tried again to connect but the same error message comes back up. It was then that I noticed the fuel tables are there but there is nothing input for the ignition/timing table it is all just set at zero. Either the program can't grab the table for some reason or it got deleted somewhere along the way. I've messed with the program enough and scoured the internet for solutions but nothing works so it's time for a change. 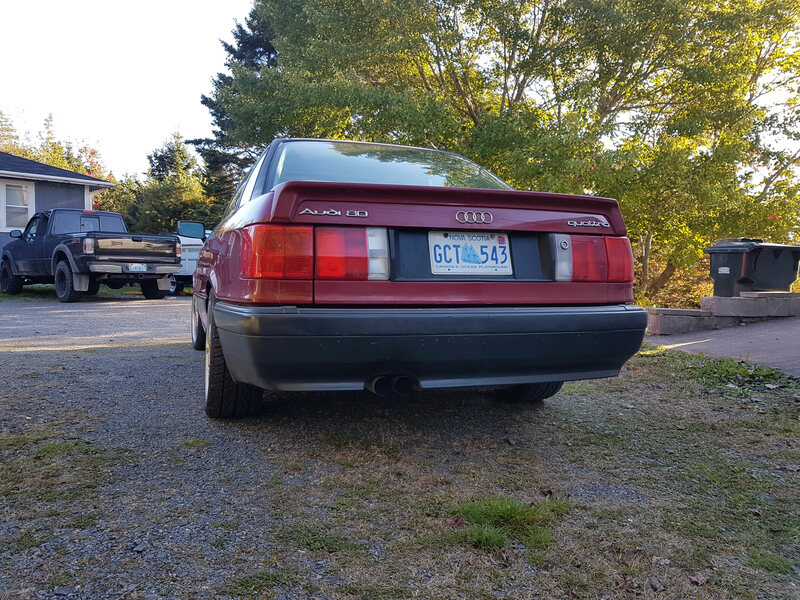 In my other audi a 94 urs4 I have a pnp vems unit and it functions flawlessly, the program is easy to use and I have not had any issues with comms. I started emailing Marc at efiexpress and am starting the process of switching to vems and getting away from the unsupported 034 iic ecu. I can't wait to get something in there I can actually work with. Lucky wrote: I started emailing Marc at efiexpress and am starting the process of switching to vems and getting away from the unsupported 034 iic ecu. I can't wait to get something in there I can actually work with. One of the reasons I took my car to Mark, was for the change from O34 to Vems. You won't find a better person than Mark for this. He even made me an adapter cable that plugged into the 034 harness and other end plugged into the Vems unit.